They say that no single experience can ever be repeated, and maybe that’s true. But this summer my husband and I plan to relive our honeymoon, while creating new memories of newlywed bliss. We spent our honeymoon in wine country, and it was one of the most spectacular memories I have to date (other than my actual wedding day, of course). We drove around in a convertible, lounged on blankets under the shade of a tree, and enjoyed sipping some of the finest wine in the world. This summer, we’re uncorking our favorite bottles from Chateau Ste. 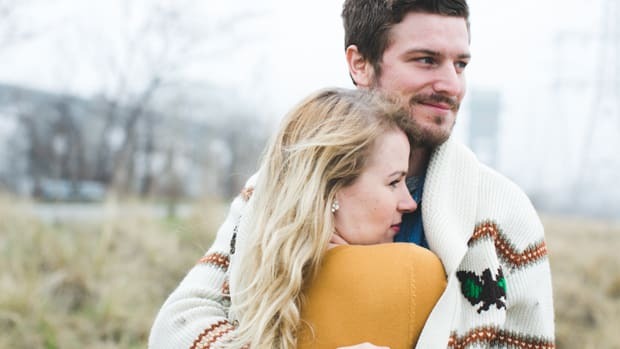 Michelle and have planned out ten dates that are sure to help those moments of romance linger just like the notes of a fine wine. One of the highlights of our honeymoon was the day we spent hiking in some of the country’s most breathtaking scenery. The two things that would have made it better? A bottle of wine and a sunset. Few things complement each other better than the allure of the outdoors and a beautiful bottle of wine. 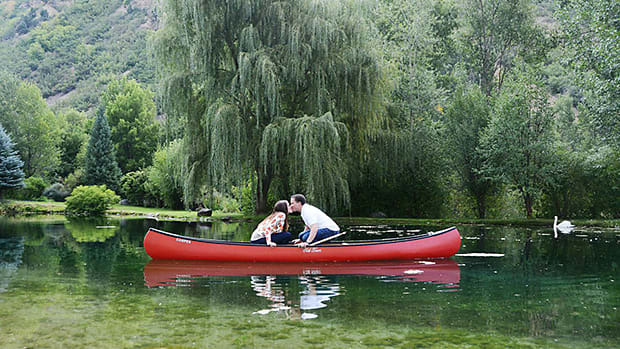 This is an easy date to pull off during the workweek while the days are a little bit longer. It doesn’t have to be an hour-long hike—just a stroll where it’s quiet and the trees are tall. Pick a secluded outdoor destination to snuggle up to your date, pour a glass of wine, and snack on a simple charcuterie spread. Every Sunday morning, the street in front of our little apartment turns into a full-blown farmers market with local produce galore. Instead of shelling out big money for a weekend brunch, make a date of a homemade farm-to-table brunch to flirt and discover more about one another. Post-market, swing by the store, and grab a bottle of crisp Chateau Ste. Michelle Columbia Valley Chardonnay to sip while you chop and sauté. I know for a fact that it pairs well with farm-fresh eggs Benedict! 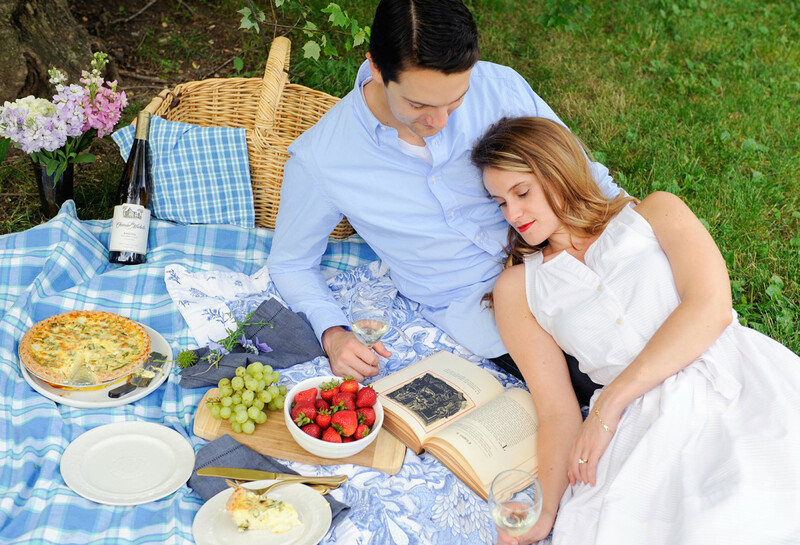 Nothing evokes more romantic nostalgia for me than sitting on a picnic blanket in the shade, giving ourselves permission to forget about those thank-you notes (which we still need to finish—we have a year, right?!) and chores back at home. Forget your to-do list, and spend the afternoon lying under some shady branches. 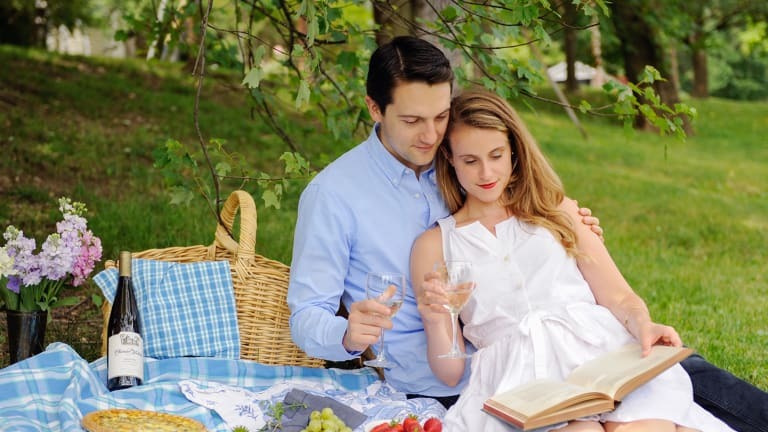 Bring that book you are dying to finish (or start), music, an easy and delicious picnic lunch (I’m thinking quiche or a summer salad), a light and refreshing summer Chateau Ste. Michelle Columbia Valley Sauvignon Blanc, and maybe even a pillow for a lazy summer nap. You and your man can read aloud to each other and spend an afternoon either reconnecting or getting to know one another. Put that blanket to even more good use with a movie night. Bring a bottle of Chateau Ste. Michelle Columbia Valley Syrah and some cured meat to your local outdoor movie locale on Friday night. Voilà! Date night is covered without the hectic restaurant crowds. Outdoor movies are unique to summer weather, and this is a fun date idea that’s really cheap. Keep close tabs on your local listings, so you’re sure not to miss out on one of the oldies but goodies. For a summer evening take on a rainy-day classic, try bowling. And I’m not talking about at your local lanes! Just insert glow sticks into ten full water bottles, and arrange them like a bowling alley in your backyard or local park. Use any ball to knock down the pins. Swap cheap beer for chilled wine, loud top ten music for your favorite throwback playlist, and eighties-inspired strobe lighting for citronella candles and fireflies. This is a great way to spend a summer evening enjoying some playful competition. 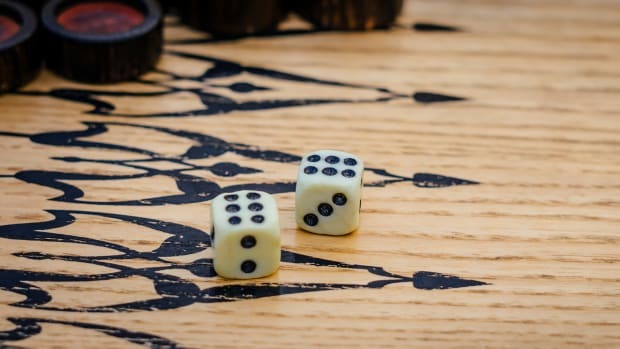 You may have read that I’ve recently gotten into board games. Turns out that they are an awesome date night activity. 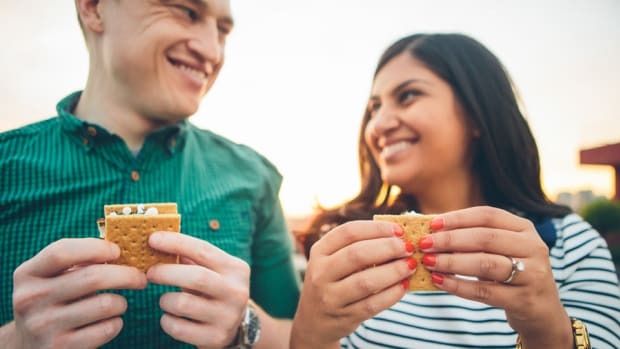 There are plenty of board games that require relationship-building cooperation and inspire flirtation—the perfect ingredients for an awesome date. My husband, Joe, and I have only had one impromptu board game night so far, but we are excited to make it a regular thing. We might even be generous enough to share our treasured souvenir wine stash with those who are willing to play! Dinner out in wine country was expensive, and the food itself is certainly not something we could do justice to at home. But there is a solution to the expensive dinner date: Eat a quick meal or order something inexpensive like pizza, and then spend the rest of the evening preparing an incredibly indulgent dessert together. Have fun creating something over-the-top: Think raspberry reductions, molten chocolate cakes, or crème brûlée. Plate it beautifully, and savor it over candlelight. Don’t forget to pair it with the perfect glass of vino. This is something Joe and I have been dying to do ever since we listened to top wine experts tell us all about what wines would pair perfectly with what foods. Why not make a night of it and have fun practicing our inner sommeliers with each course? The Chateau Ste. Michelle Columbia Valley Chardonnay has a bit of citrus and is slightly oaky, perfect with a creamy Caesar salad. Then try something darker and more full-bodied like Chateau Ste. Michelle Columbia Valley Cabernet Sauvignon paired with a perfectly cooked steak. End with a nice Riesling paired with a quintessential summer dessert like peach cobbler. If sweet Riesling isn’t your taste, try the Chateau Ste. Michelle Columbia Valley Dry Riesling. It’s incredibly food-friendly and will be the perfect complement to your dessert. Whatever you put together, make sure you take turns telling the other person why this wine is the perfect choice for the dish in front of them. The one thing wine lovers love more than a good bottle of wine is sharing it with someone else. Joe and I brought back a few bottles of wine from our trip that we are excited to share with our friends, and we’re interested to see how they measure up to some less expensive brands at our local wine shop. Invite a few friends over and have them sample a variety of wines blind. Cover the labels and make a game of guessing price, varietal, and, if you are real pros, maybe even vintage (good luck with that!). The winner gets to take home the bottle of their choice. Don’t let the summer sneak by without spending some time by the water. Actually, this is a great opportunity to combine a couple of date ideas into one. Joe and I agree that the perfect date would be to rent a convertible again, but instead of vineyard hopping, find ourselves on a quiet dock somewhere. If you’re lucky enough to be only an hour or two from the beach or a lake, jump in the car early in the morning, and spend the day in the sun and sand (or silt). Pack a lunch, snacks, and a bottle of wine on ice. Don’t let summer slip away! Sip and savor these warm summer days with your guy by your side. Be sure to enter Chateau Ste. Michelle’s 10 Perfect Sips Sweepstakes for a chance to win a trip for two to Seattle and tickets to a special winery concert series. Sponsorship disclosure: Wines from Chateau Ste. Michelle were provided for editors to try.